For the past 13 years - ever since its introduction - riders have been looking for a way to extend the maximum speed at which the cruise control could be set. 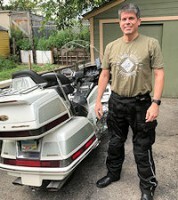 The efforts that I'm aware of approached the problem with the thought of "fooling" the cruise control unit into "thinking" that the bike was going slower than it actually was. There were inputs to the Cruise Control from 4th and 5th gear positions. Sure, the fact that there was still input from the speedometer meant that road speed could still be the determining factor, and, since the Cruise Control will only work in 4th and 5th gears, the inputs could merely be giving the CC that information, but -- more tests were in order. First, I determined, by road test, that ~80 mph CC limit was the same in both 4th and 5th gear. I also noted that the actual (GPS indicated) speed was always 78 mph, while the speedometer would indicate between 78-81 mph on any given ride, although the engine RPM was always the same. I took this as another indication that engine speed, not road speed, was the determining factor for maximum cruise speed. It now appeared that the solution to the problem could be to try to make the CC think that the transmission was in 4th gear, although it was actually in 5th. Now, how to do this. Examining the manual (see diagram) showed the color code of the wires inputing the transmission sense into the cruise control, and also showed a connector - C33- where these wires could be accessed after inputs had gone to the engine control system. After all, I only want to fool the Cruise Control, and not the engine control module. The picture (below) shows where this connector is located. 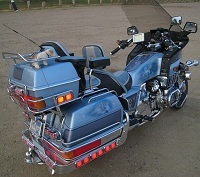 The picture was taken by someone standing in front of the right saddle bag; the shiny black surface in the lower right of the picture is the front of the rear fender. Even though the picture caption states that the trunk is removed , as you can see by the location of the shock, it's only necessary to remove the seat to get to it. Cut both wires, leave the grn/org wire to the cruise control disconnected, and connect both wires from the shifter to the red/wht wire coming from the cruise control using a diode in each wire with the cathodes away from the cruise control. I could then set the cruise control up to 80 mph in 4th gear and 100 mph in 5th. Disclaimer: This worked for me, but it may not work for you. If you decide to try it, and break something (including yourself) that is expensive to repair, don't blame me. To date I've heard from two riders who have modified their '98SE's (one was a European version) with the desired results. At least one opted to relocate the pins in the plug to avoid cutting the wire. I've decided that is the way I'll go in the future; I won't install the diodes, since I can't see why I would ever want/need to set the cruise control faster than 65 mph in 4th gear. Another person commented that setting the cruise control in 4th gear, shifting to 5th, and pressing "resume" results in the Wing accelerating. This makes sense, since the engine is trying to return to the same RPM in 5th gear that it was running at in 4th. I had never noticed it, since I seldom engage the cruise except in 5th. From what I'm hearing, 93 seems to be the earliest year that this works on. I've had several reports of negative results with 92s. Good that this info has been saved. If this doesn't work on your 1500, here's how I beat the limit on my 1989. Thanks for posting the info. I wonder if the original article got taken down because someone surmised that 81 MPH is unsafe? If so, they need to move from Pennsylvania to one of the mid-west states. I wished I had this info years ago. I was on a three state trip with two friends that rode 1500s. The first and last day of our trip [when the posted limit was 80 MPH] they kept falling back because of their cruise control limitation, but then manually sped up to catch up. It was not ideal at all. One safety issue is that the 1500s were traveling at less than the speed of most other traffic. Many Honda speedometers read almost 10% high, and their CC put them well below the 80 MPH [or more] the other traffic was traveling. This generated a lot of lane changes right on their tail. I could have slowed down to their speed, but it would have made our long days of travel even longer, adding to our fatigue. I did it the same way by swappping the female connectors. Easy, clean, and efficient.